Capture stabilized action camera footage while on the move with the G5 Handheld Gimbal from Feiyu. 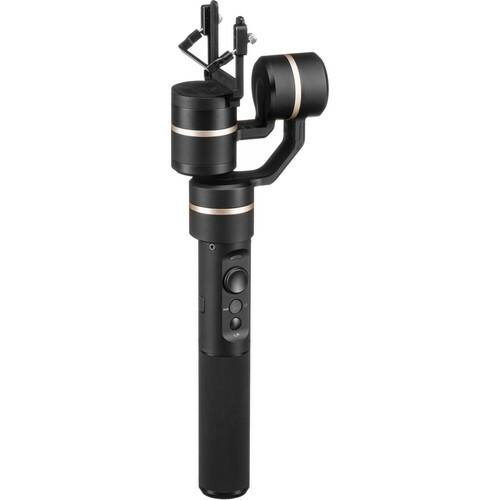 The gimbal is compatible with the GoPro HERO7 Black/Silver/White, HERO6 Black, HERO 2018, HERO5 Black, HERO4 Black/Silver, and other action cameras with approximately the same size and form factor as those GoPro models. The gimbal is IP67 water-resistant, dust-resistant, and splash-proof. It can be used in under 3' of water for up to 30 minutes, as well as used safely in rain or snow. It features a handgrip that doubles as a battery holder and has integrated gimbal and camera controls. The removable battery lasts up to 8 hours. Box Dimensions (LxWxH) 13.1 x 8.0 x 2.0"
G5 Handheld Gimbal for GoPro HERO7/6/5/4 & HERO 2018 is rated 3.6 out of 5 by 23. Rated 4 out of 5 by Anonymous from A great product for traveling. Lightweight and easy to carry in your backpack. I only gave it 4 stars because it was a little hectic to calibrate it from a program you have to download from the website. Other than that, everything works pretty well and I've been running around Greece and China with it. My footage was so smooth! Even riding in a car on rough roads while hanging out of the window is great. I wish they added a handle to the bottom of the Gimbal. Like a strap around your wrist incase someone hits your hand and you might drop it. There were some close calls, but luckily I had to grip it tight. Rated 2 out of 5 by Anonymous from Total fail I'd have to rate this item a total fail. The action of the motor affects the audio of the GoPro5 (which actually has decent audio capabilities, compared to previous models), making ALL of it totally un-useable. Since there's no audio input (and can't run a separate line to camera, you can basically only use this item if you have no interest in capturing audio). So, that alone is a fail. But also, the gimbal itself is highly unreliable. Sometimes it's okay, but usually within a longer shot, it will simply skitz out and turn in some random, unwarranted direction. If you're trying to capture crucial action (and won't get a second chance) I wouldn't rely on this item. Wasted money. Rated 3 out of 5 by Grayden from Great features, but not the best. I purchased this gimbal back in December because I liked the idea of it being water resistant and the only thing (at the time) that was compatible with my hero 5. I really enjoyed using this as my first gimbal but since day one I noticed some issues. The panning controls are a lot slower than I expected and there seems to be no way to speed them up in the settings via the app. This isn't an issue when shooting at superview, but that's not the only setting I tend to use. If you are doing anything while operating the gimbal at the same time, it can be a hassle paying attention to both. I went out to the slopes of Breckenridge to test it out. During that time I either had to constantly adjust what it was pointed at, restart it due to a malfunction, or just ride and forget about the shots I was trying to get. This product is still new so I'm hoping that the malfunctions will become less frequent, as well as an increase in panning responsiveness in future firmware updates. I really like the ability to mount it to tripods for higher angles or a hands free motion control via the app. It's great for the price, I have no prior gimbal to compare it to, but I'm hoping that the problems I'm experiencing now, aren't everlasting. TDLR Steady footage, low motor noise, and if you don't mind devoting your whole attention to it every time you plan on using it, then go for it! Rated 4 out of 5 by J2X from Works great. The gimbal works very well. It takes some time to understand the operating instructions because the instruction booklet that comes with it is terrible. The print is so small you need a magnifying glass and the illustrations don't really tell you how to use it. My recommendations are to get the operating instructions on YouTube. Other than that, I does a nice job. I recommend getting an extension stick to provide more variety in the shots. I would also recommend finding a wrist lanyard that would screw into the handle to prevent dropping the gimbal. Rated 3 out of 5 by spirit bomb from G5 gimbal the sound in the gimbal is very loud expecially with hero5. do not recommend with hero5.a tough gimbal. I fell face down and hit the gimbal on hard snow but the gimbal does not break. Rated 1 out of 5 by Govenator from Noisy and Bluetooth does not work Returned the first unit because: 1.no Bluetooth connection could be established 2. No soft ware to update the unit with a Mac 3. Software for PC generated only error message 4. No technical support from manufacturer Second unit has the same issue. Keeping the unit because it is the only splash proof unit on the market and it has a good battery life. Unit is not completely balanced when switched off. Counterweight needs a few more grams. Switched on it balances and works well with a hero 5. Motor is noisy! Does not effect shots in noisy environments, but makes it useless to record a conversation. All it would take to fix it are some rubber pads to insulate camera and gimbal. No problems with the return of the first unit. B&H was great. No support from manufacturer at all. If you do not have an urgent need, wait till one of the other manufactures, which have customer service come out with a splashproof version. Rated 5 out of 5 by JoeJoe the wildman from G5 Handheld Gimbal for GoPro HERO5 / HERO4 Product as described works very well works off the iPhone with the iPhone app I would recommend this product to anybody that's in the gopros or any type of other movie making very happy with the product. Can the gimbal charge the Gopro? Yes. The gimbal includes a set of really short micro-USB to USB-C or Mini-USB cables specifically to allow the camera to be plugged in to the gimbal allowing the camera to charge from the gimbals battery while it is powered on. This will compromise the IPX rating of the GoPro. Also, on the Hero5 the USB port is located behind a hinged port cover, which would remain open, possibly risking being bumped and damaged. The gimbal operations are not obstructed by the USB cable or open port cover. I just got my G5 and it works satisfactorly except for audio interference from its motors on the GoPro. It sounds like running water and is present about 90% of the time. Does anyone have a fix suggestion? Outside of doing MOS shots or using and external mic, there is not much that can be with the sound of the gimbals motors. This gimbal weighs 271 grams without the battery. We do not have the weight of the battery listed, however the battery it uses is very small and will not make a major difference, it should only add 20 grams or so. Can I charge the Feiyu G5 without taking the batteries out? Via USB cable? Its the only way to charge it, with USB. amazon is listing 2 versions. the upgraded version is labeled v2... so which is the B&amp;H one? I purchased the G5 and I and have had a problem. The G5 when I installed the battery the G5 will not turn off. To turn the G5 off I have to take out the Battery. When I called B &amp; H they told me that there was no repair facility in the US and I would have to send back to China. Had I known this I would never considered Feiyu and disappointed B &amp; H has no answers so it is an expensive Lesson. don't let it happen to you.Thanks Tom M.
Where can I buy the weight for the gimbal? I know. I lost it while running and I need a new one. Any suggestions? Does this work with the Yi 4k Action Camera? Yes. It works with yi 4k very well. I am using it.